I was playing around with a new discovery, Charm Packs ( 5X5 inch squares of a line of fabric), and having a lot of fun just laying them next to each other to see what looked good together. I had to make something with them so I got out some books and magazines and things I had printed off the internet. After looking through all this info and brainstorming for hours even in my sleep, I decided to make a little patchwork bag from a Tilda book by Tone Finnigan. It turns out that the bag is just the right size to hold my Charm packs. I hadn't planned it, but it sure is handy since they tend to get lost in my other stash. 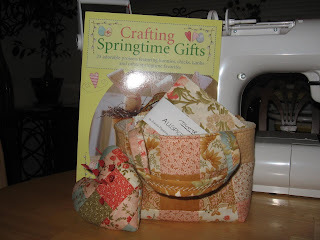 I am thinking of making the little bag to hold some sewing supplies so I made a pin cushion to match and am working on a plan for another such bag to have a pin cushion and needle book to go with it. I filled my heart pin cushion with a little recipe that I made up containing Ground walnut hulls, rice and lavender. It is just the right weigh and smells good too! More charming little bags and pin cushions to come I think. While researching things for this project I also came across a fun blog called Hugs from Helen. Helen has brought together some fellow designer bloggers that have each designed a project with a free tutorial. She then posts a hint and a link to where you can visit the blog and print out the tutorial. I found some really cute projects that might make some fun little gifts just in time for the holidays! Several I will have to make for myself. There were 2 cute bags with some simple embroidery by May Britt and Cinderberry Stitches. Both of these ladies have wonderful blogs with lots of fun tutorials and great ideas. There are lots more too, so be sure to check it out if you are on the hunt for some great quick little gift items to make for someone else or just for you! I use the excuse that I am practicing to make a gift for me...I've been getting a lot of practice lately. Hope you have a simply charming day! 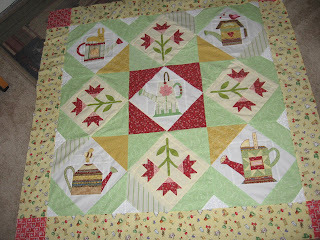 After a lot of ripping and resewing I finally got the 'Thyme to Water' quilt top finished. I learned a lot from this project about my sewing machine and about the importance of measuring accurately several times and sewing with a perfect 1/4 inch seam. It was the triangles that gave me the most trouble though. It seems that when you cut a square into fourths you get some part of the triangle that will be cut on the bias. I have seen a video by E leanor Burns where she shows a great way to cut triangles in a strip so that you don't end up with any stretchy bias problems. I will have to put this into practice next time I cut triangles, but I am avoiding doing anything with triangles for a while. I decided that I didn't want to use the flower pot border on this quilt and used this adorable garden themed fabric I recently found instead. I think it all goes together pretty well and made a fun quilt with more attention to all the hard work I spent on the center. I have several seams that are still not matching exactly, but I am not stressing over them since this is just a fun throw for me. It is all a learning experience that I hope to put to use one day soon on a quilt for my bed. I have several projects in the works, but still found time to start another. I was attracted to a fall quilt I saw on the cover of Better Homes and Gardens American Patchwork & Quilting. 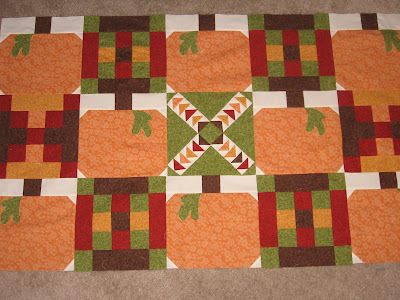 It has some great pumpkins and I had just got some fat quarters in some great fall colors so I did a little mixing up of things and am making a wide runner. I tried several different blocks before I came up with blocks between the pumpkins. 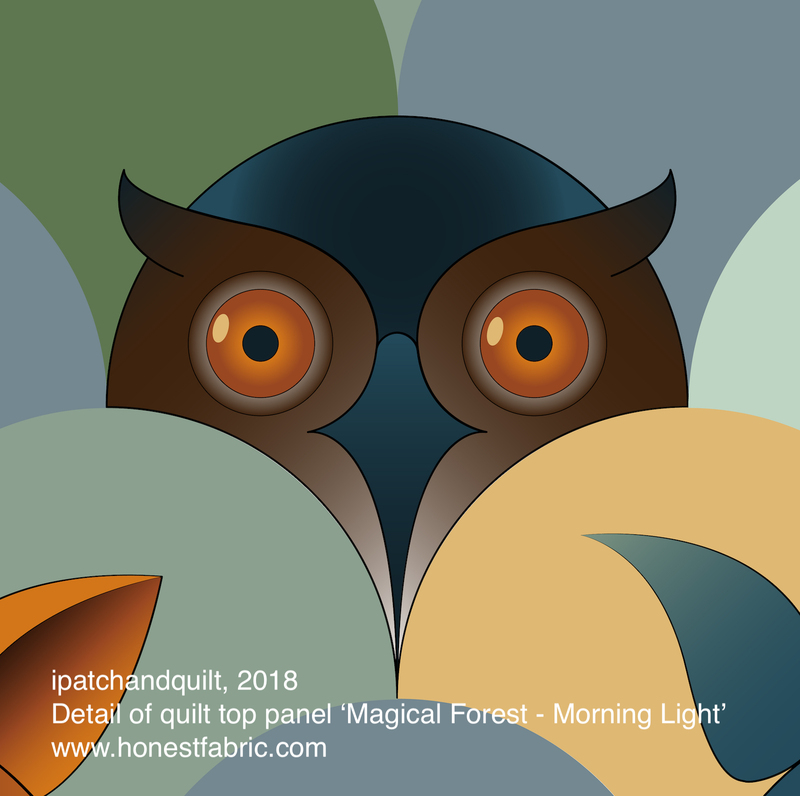 The designer of the quilt, Avis Shirer of Joined at the Hip used a wonderful block with flying geese, but after trying my hand at just one I opted to use something a little simpler. I did throw my sample block in the center of my quilt though. 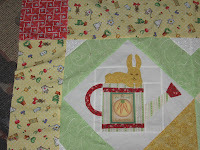 I still have to work up a back for this and get creative with some quilting and a border. These were fun projects that sort of represent the seasons of Spring and Fall to me. My favorite seasons of the year. I always wonder if other crafters make things with a specific purpose in mind or do you make things just because you think it would be fun to do. I do a little of both I guess. I made these two projects with no real purpose in mind, but I am thinking that they will look at home on my couch or over a small table. No matter what I use them for I am getting a lot of pleasure from just creating something that I enjoy looking at. Yesterday was a really great day. First I got to go to a quilt shop that I have heard a lot about, but never been to. Since it was on the way to our fishing spot of the day we stopped in and looked around. The shop was called In Between Stitches and it was really nice. They had so many great fabric lines and nice sale prices. The staff was very friendly and helpful and I was having way too much fun finding things that I might need someday. 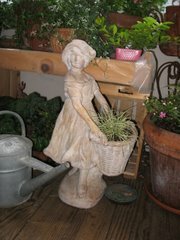 I first heard about this store on Pam Kitty Morning's blog and am so glad to have found it. I will be going back! Thanks Pam! I found another blog today that was a really fun blog and so full of fun ideas. 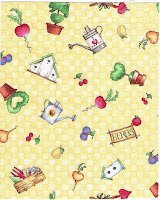 It is called Patchwork Pottery by Laurraine Yuyama designs a lot of quilt and fabric things. Laurraine also has an etsy shop where she sells a lot of the little teacup bags and other cute things she makes. I am loving all the coffee and tea things and the cute little trivets, one is a bee hive and the other is a nest. I am thinking I would like to try this and I think she is making a pattern so I will be checking back to see. This lady is so crafty with fabric that she makes pincushions that look like books and even cupcakes. There is no end to what a crafter will try to create! Yesterday after the trip to the fabric store Michael and I went fishing at a favorite spot of ours Las Vaqueros where we made some great catches. First we caught a nice trout with a little tag which won us a free 1/2 day boat rental. 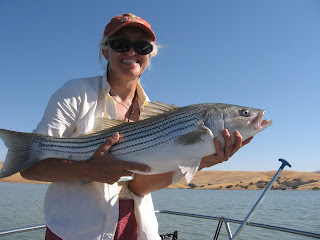 Then we caught a 10 + pound stripper that took me about a half and hour to bring in. It really was exciting! We thought the stripper was so beautiful that he needed to live at least another day so we put him back in the lake. 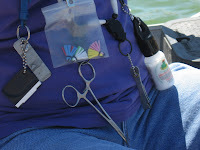 I have become quite fascinated with the amount of 'jewelry' that fishermen carry in their tackle boxes. Michael even wears this necklace that has lots of little tools attached to it, I think I need something like this for sewing. Everything just pops off when he needs it. There is some real colorful stuff in his tool box. I have questioned whether or not the fish really care about all this colorful flashy stuff only to be told that, of course they do, it attracts them you see. 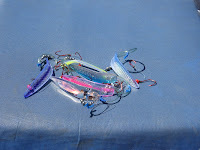 Yesterday we caught our best catches on some pretty plain lures with no flashy things attached...so I have concluded that the jewelry is more for the fishermen than the fish, but I am also very attracted to it so maybe it is to help them catch a good fisher woman. Hmmm we will have to do a little more research on this topic I'm sure. Happy Crafting, Fishing or Blogging...or all three!